An engaging read. Reserved for daffodil-2 as part of the Wishlist Tag game. Received in the post today from Brunton11 as part of the UK Wishlist Tag Game. Thanks very much I look forward to reading it. Sorry! Also meant to say thanks so much for the release bags, magnetic bookmark and b.c. labels-you are very generous. REVIEW:- "I really enjoyed this book although it told a very harrowing story at times. I thought the principal characters and their emotions were very well described and explained. I liked how Dragan-initially too scared to cross the street overlooked by snipers- later risked his life to drag a dead body from the street to prevent a foreign news cameraman from filming it. He didn't want the world to think that his country was a place where dead bodies could be abandoned in the street-very poignant. I listened to Albinoni's Adagio in G Minor (played by the Cellist) after I'd finished the book and realised that I too knew the music well but not the name of it. I think the story will stay with me for some time, especially as I know it is based on fact." I am reserving the book for my husband in the first instance then will try to find another good home for it. 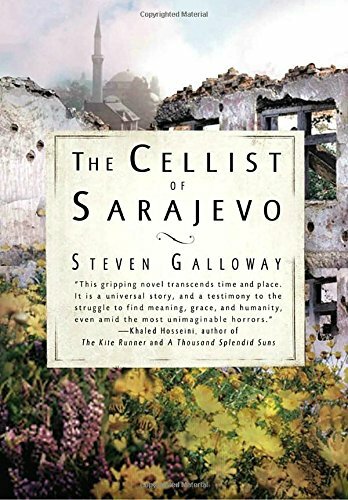 My husband has now read this book and comments as follows:-" An enjoyable read which gives the reader an insight into what happened during the conflict in Sarajevo based on what the author was told by various people." I am now reserving the book for Sedona72 as I think she will like it. This book was given to my friend and fellow bookcrosser Sedona, by the swimming pool this morning. I hope she enjoys it.